KERRVILLE, TX. — Former San Antonio Spurs, Avery Johnson widely referred to as “The Little General,” has been named the keynote speaker at the Tivy Athletic Booster Club helping the Kerrville Tivy Athletic Hall of Fame committee celebrate the 10th anniversary for the first inductees. The celebration banquet will be held Thursday, Sept. 3 from 6-8 p.m. at the Inn of the Hills Resort & Conference Center. Source: Hill Country Community Journal. 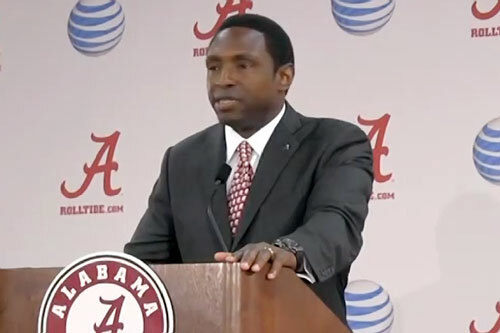 Johnson is currently the head basketball coach of the Alabama Crimson Tide. Johnson spent 16 years in the NBA as a player, and subsequently served as the head coach of two NBA teams: the Dallas Mavericks and New Jersey/Brooklyn Nets. He led the Mavericks to their first NBA Finals appearance and to three consecutive 50+ win seasons. During his playing days, Johnson was known as the “Little General” for his small stature, his leadership skills as a point guard and floor general, and his close friendship with former San Antonio Spurs teammate David “The Admiral” Robinson. Sports Speakers 360 is a booking agent for motivational sports speakers. If you would like to book Avery Johnson for a speaking engagement, appearance or endorsement, contact Avery Johnson’s booking agent for fees at 1.855.303.5450.